Dog food advertising can make you feel that a dog’s sense of taste is very discriminating which is quite far from the truth. A dog’s sense of taste is much less discriminating than a human’s is. Humans have around 9,000 taste buds and dogs only have about 1,700, about 1/6 of ours. 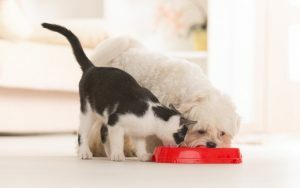 Dogs do have the same four classifications that we do: sweet, sour, salty and bitter, but dogs also have special taste buds for water and cats and other carnivores have them too. These are found on the tips of their tongues where they lap water. It is most sensitive after eating salty and sugary foods. It has been postulated that, when in the wild, animals might need more water after eating certain foods that could dehydrate them. Nature has played a role in their four taste sensations as dogs respond differently than humans. Dogs don’t have an affinity for salt as we and other animals do. Their ancestors’ diets consisted of about 80% meat in the wild and meat is a very salty food. Making salt less palatable is nature’s way of limiting excess salt intake. Since dogs are omnivores, they have also developed a liking for sweet flavors – likely developed from the fruits and vegetables that their ancestors ate in the wild. So if dogs can taste, why do they eat everything from prime rib to garbage. The answe4r has to do with a dog’s sense of smell. A dog’s ability to taste is about one sixth of ours but has sense of smell is up to one million times stronger. Smell and taste closely related but dogs can actually taste food through their sense of smell with a special organ along the dog’s palate. For instance, dogs can differentiate between meat-based and non-meat based foods without smell but they can’t differentiate between chicken, beef, fish or pork without smell. Humans do not have the ability to taste smell like this. It does though make you understand why if something smells good to a dog, it will taste good also. This is, also , why dogs are more interested in foods that smell stronger, such as canned foods versus dry kibbles. Canned food is often much more aromatic and because of it, more enticing.